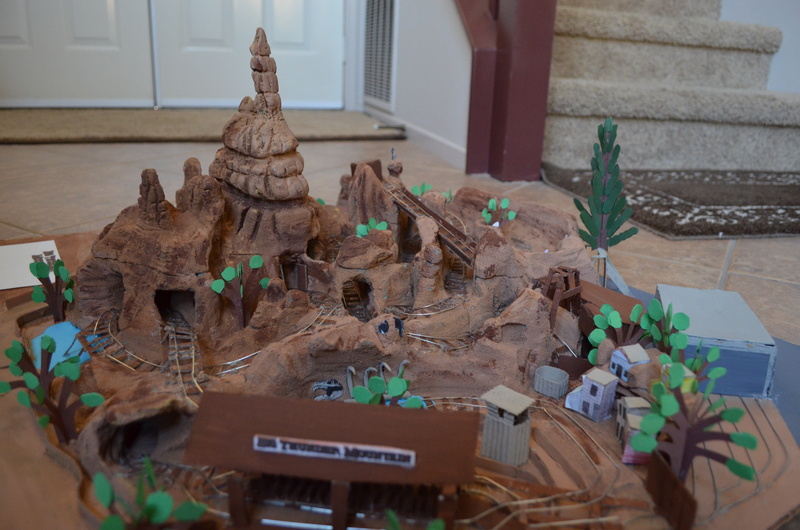 Big Thunder Mountain Railroad opened in 1979. 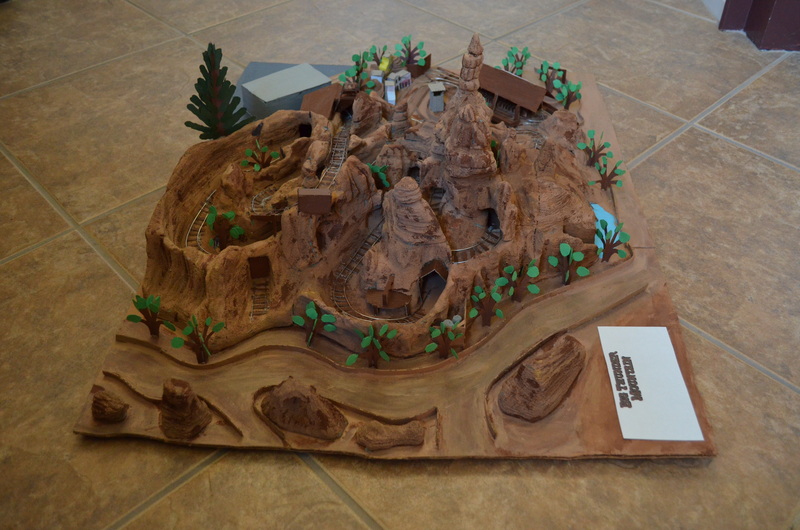 The themed family coaster was built by Arrow Development and was designed by Tony Baxter. 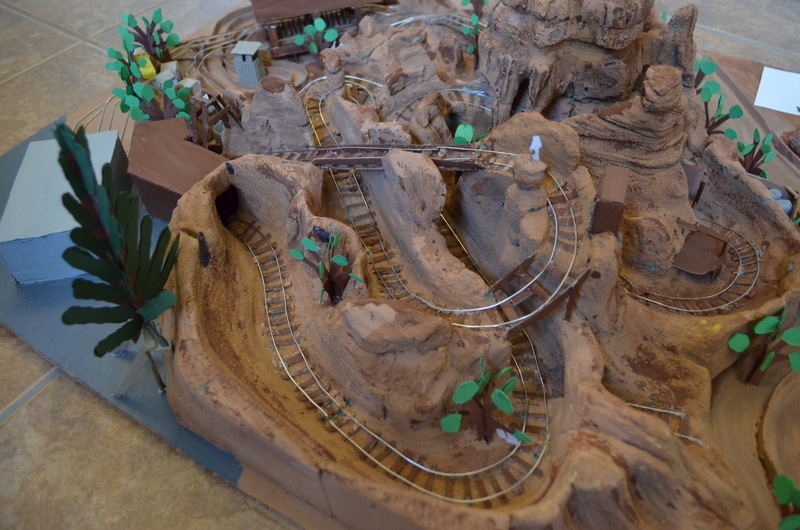 The attraction was built on the former location of the Mine Train through Nature’s Wonderland and they reused portions of Rainbow Ridge. 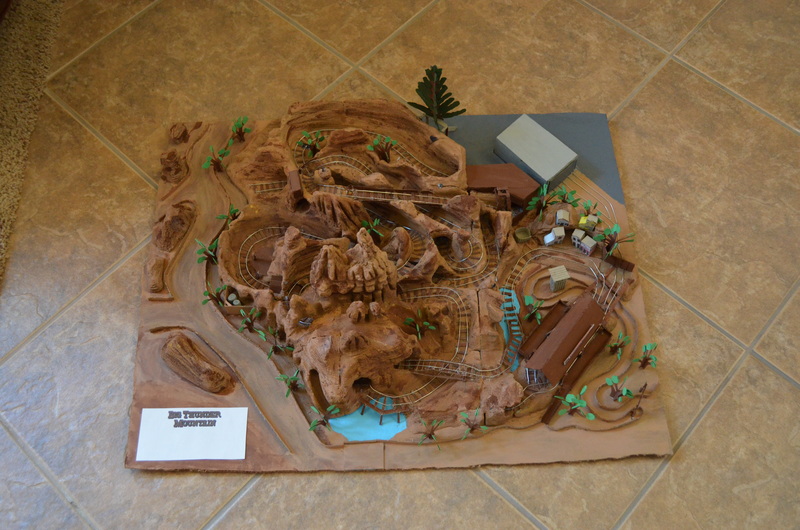 Big Thunder Mountain was closed for over a year in 2013 for a complete replacement of the coaster’s track, rebuilding the city of Rainbow Ridge, and a new “explosive finale”. 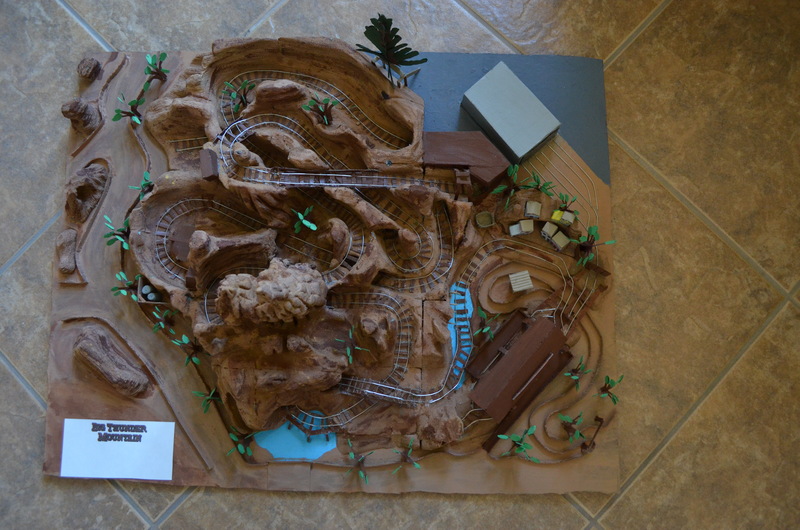 The new track was built by Dynamic Attractions. 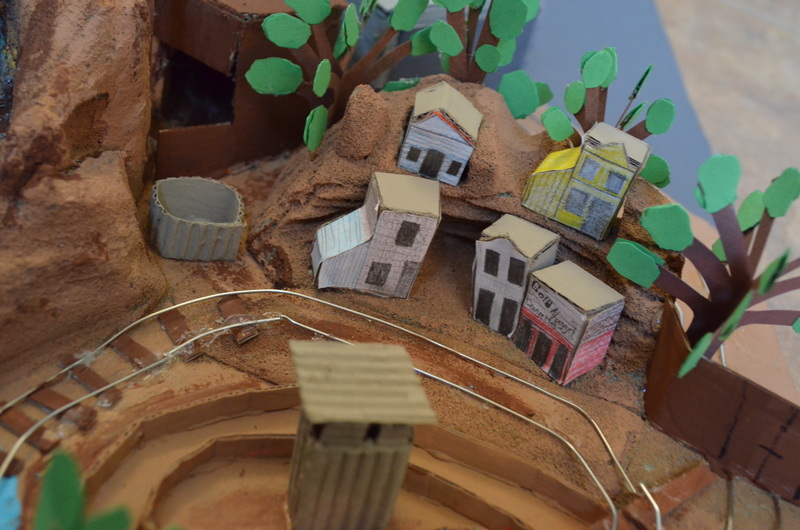 The final uses CO2 explosions and they added two tanks outside the mountain. Also, the attraction has restyle become a comic under the Disney Kingdoms banner. 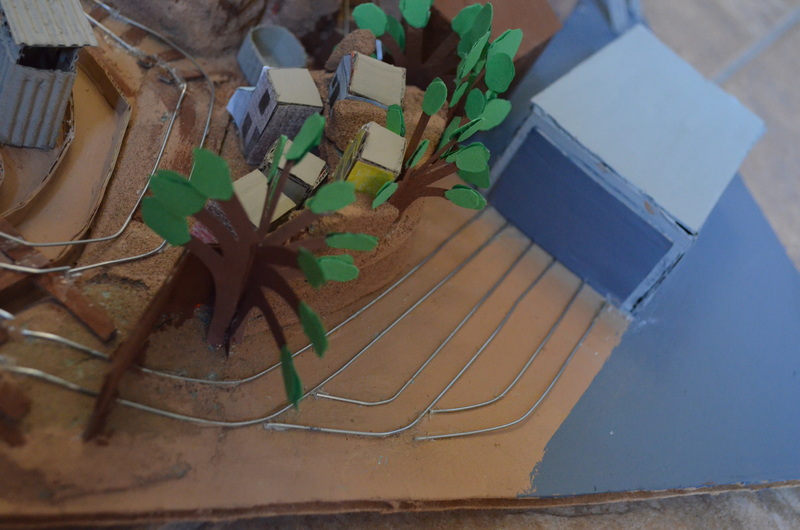 This model was started on January 18th and finished on March 26th. 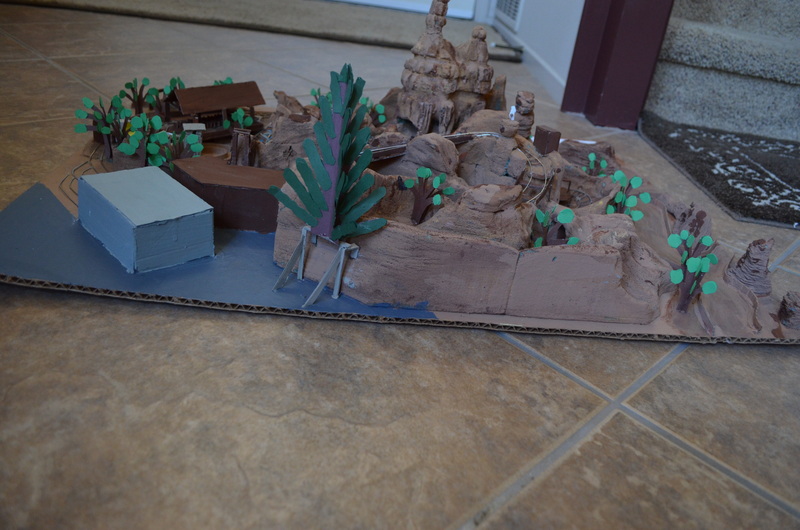 I worked on the model for a total of 8 days. 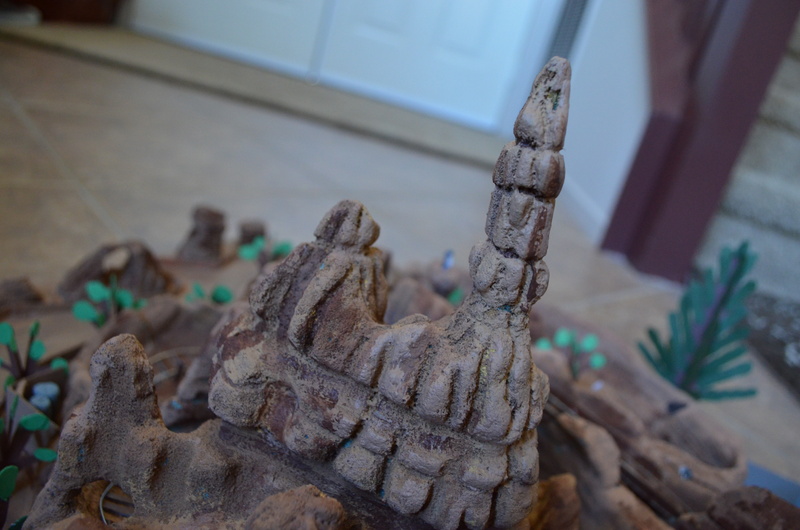 The rock work is constructed out of foam and painted in four different colors. 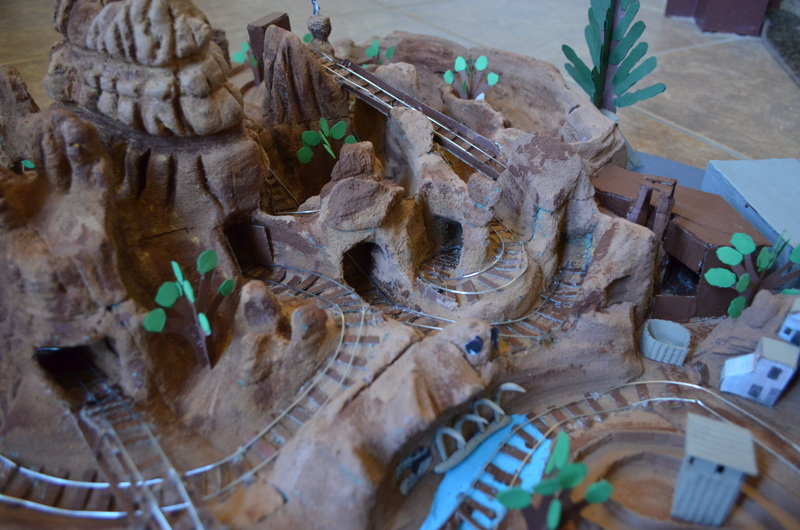 The track was made out of metal wires and there are over 338 railroad ties in the model. 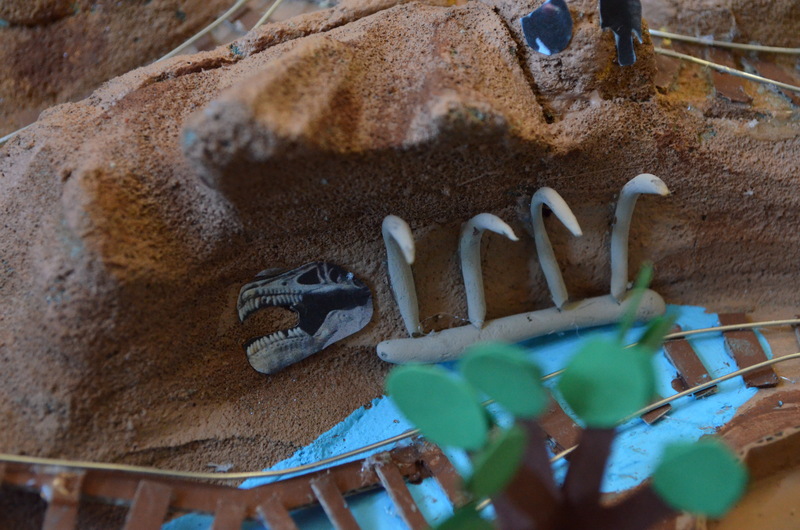 The dinosaur ribcage was made from Sculpey clay. Here is the false tree that the flying system that Tinkerbell flies from is housed, the other end is in the top of the Matterhorn. These two tanks are used for the explosive finale. 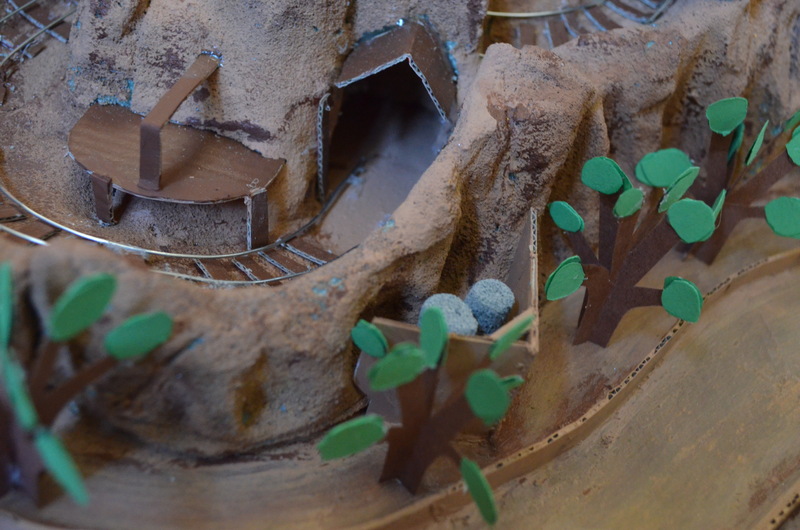 The rocks here in the back are leftovers from the Rainbow Ridge Mine Train era. 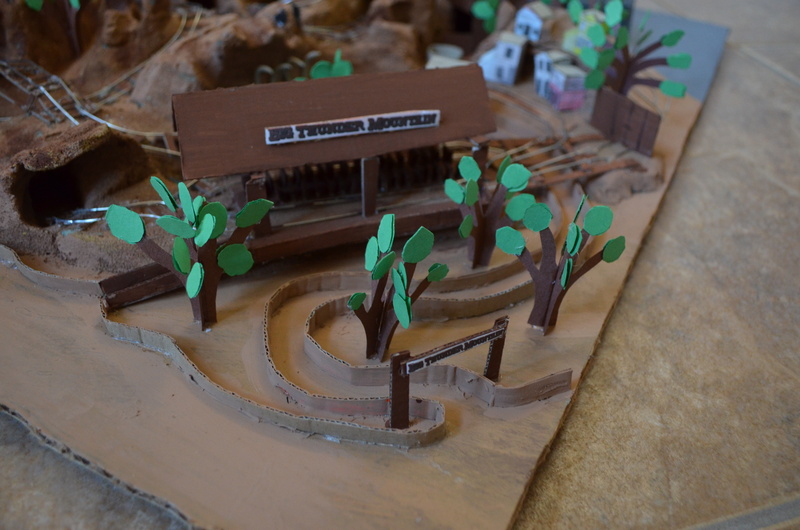 This model took more time to build compared to previous models, but the final result is pretty good. I hope you enjoyed this model, it is one of the best in my opinion. 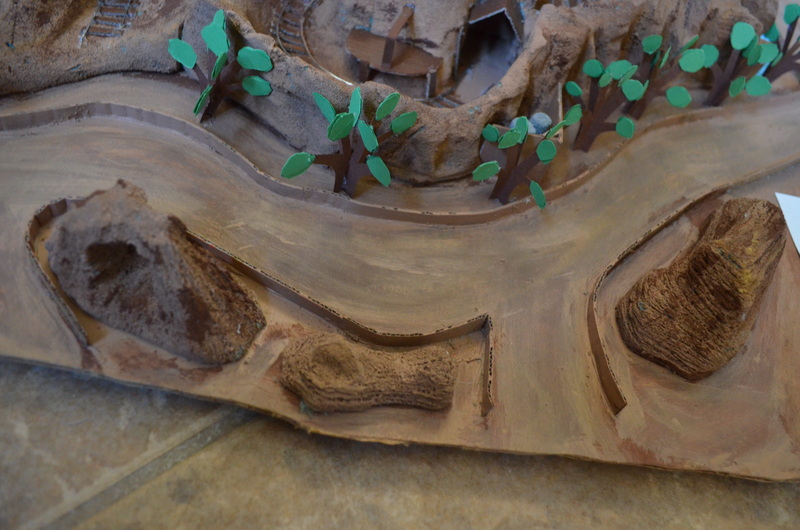 Please let me know what you think of this model by leaving a comment below. 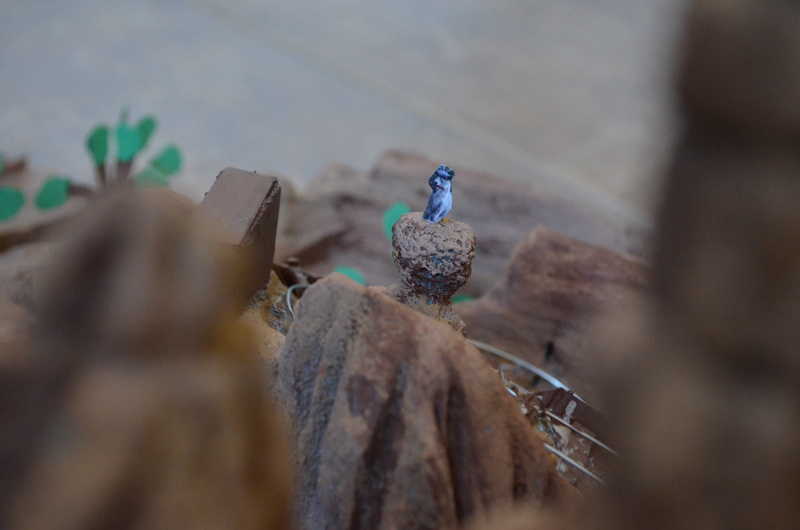 You can follow progress on my upcoming projects on Twitter and Facebook. Well done! 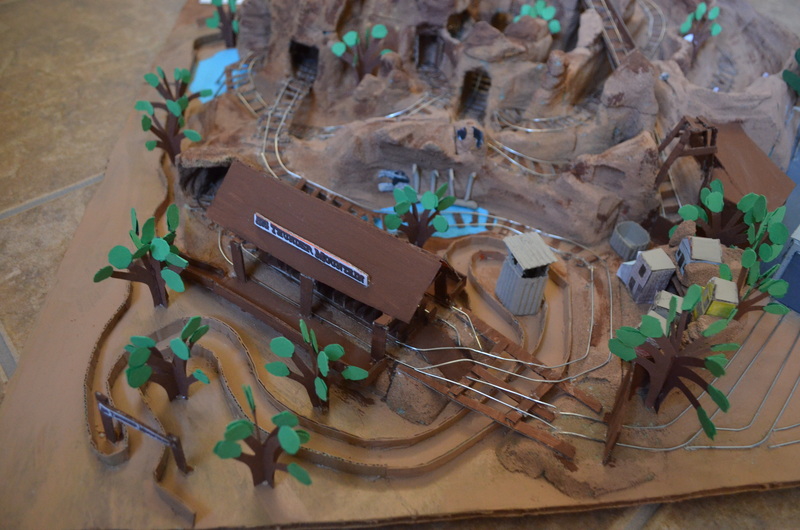 The look and style of your model is very good… it matches the wild whimsy of the real Thunder Mountain!